Today we visited the first gem of our trip: Valencia. 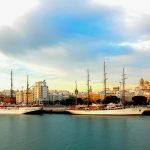 Valencia is located in eastern Spain and has a distance of 350 kilometers to Barcelona. Valencia ist he third largest city of Spain. 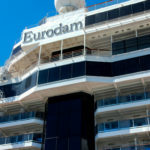 The MS Eurodam was in port from 8 am to 4:30 pm. Since we have already been in this beautiful city, we planned to visit the aquarium this time. 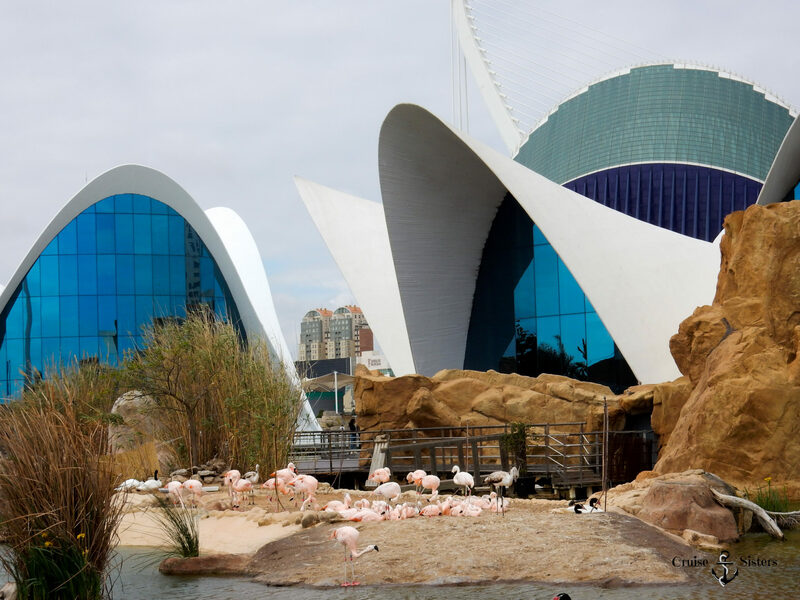 The Aquarium of Valencia is Europe’s largest aquarium. 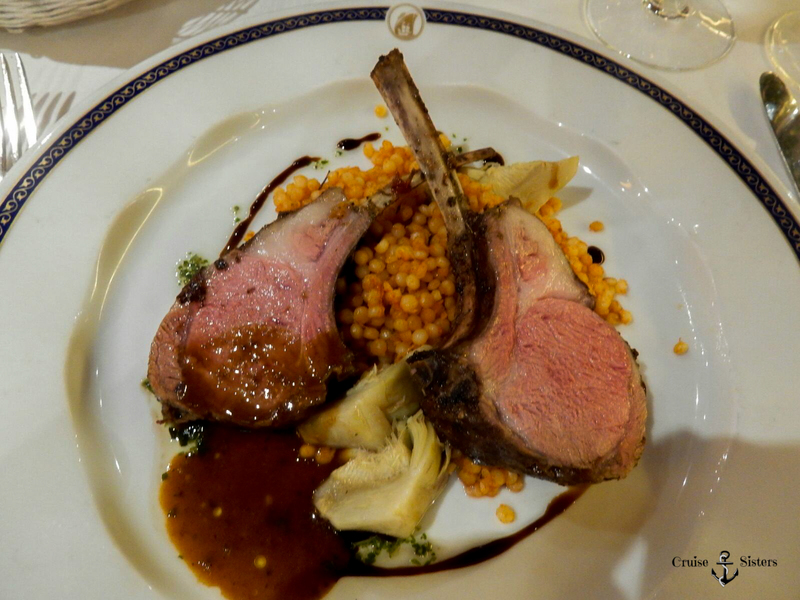 On the first day on board we received a travel guide from Holland America Line called “Your Europe Explorer: Your Guide to the Destinations, Dining, Events and Entertainment along your Journey”. This useful brochure had tips for every destination on our cruise. 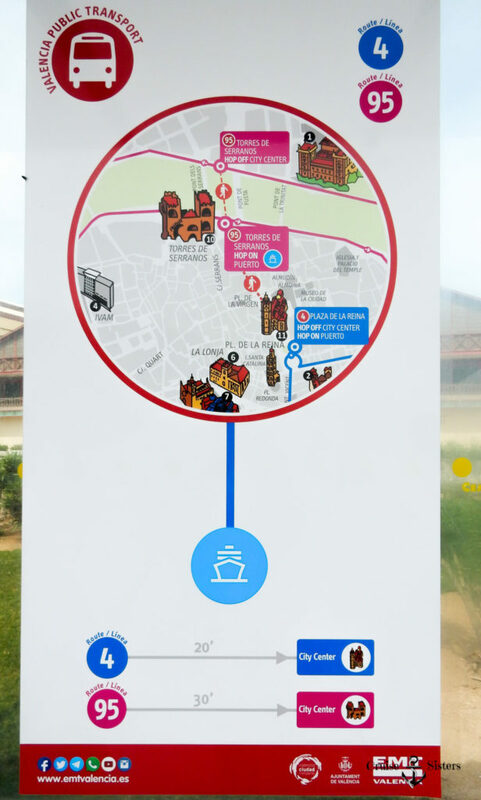 There was a map and some information about the museums, churches and other sights of Valencia. The weather was unfortunately not so good, but at least we had 19 degrees and it was not too warm. 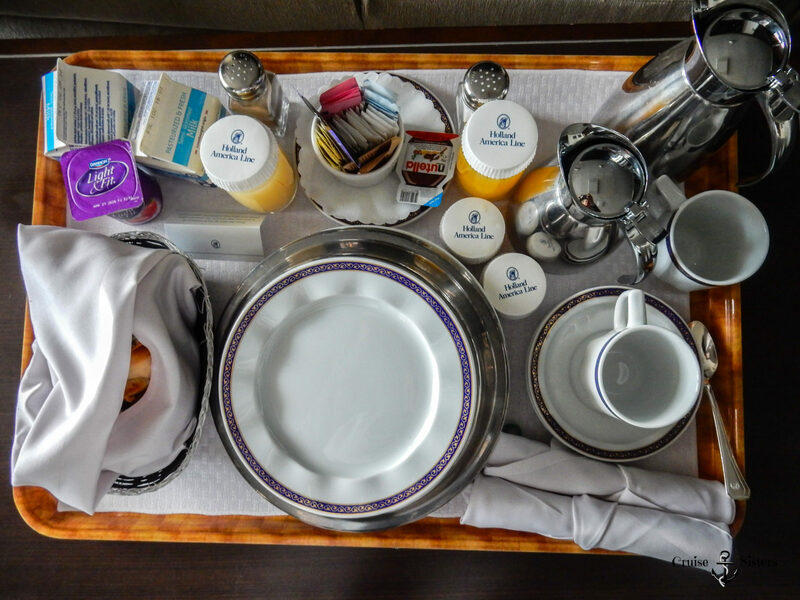 We wanted to start early in the morning and ordered breakfast to be served in our Signature Suite. To eat breakfast in the cabin, you fill out a list in the evening, where you can tick several drinks and dishes for breakfast such as coffee, tea, milk, juice, bagels, toast, scrambled eggs, bacon, cereals or muffins. 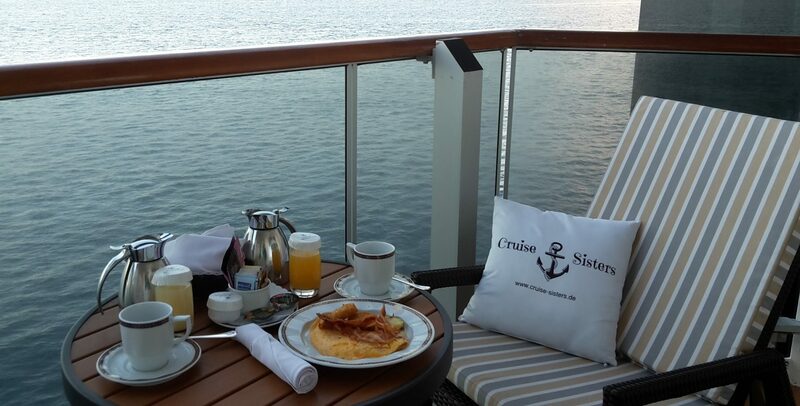 You also write down the number of persons, the cabin number and the desired breakfast time (from 6 to 10 am). You have to place the list outside of your cabin door untl 2 am at night. The next day we got our breakfast on a large tray and were strengthened for the day. Now it was time to go to the aquarium. 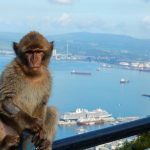 How to get from the Port to the City Center or to the Aquarium? Holland America Line offered a shuttle bus from the ship to the city center. Tickets could be bought on the ship. The first shuttle bus started at 8:30 am and the last shuttle bus left at 4 pm. Of course there were also several taxis right next to the port building, which offered different tours. A ride to the city center cost about 15 euros and it costs 9 euros to get to the aquarium. The taxis also offered sightseeing tours for up to 4 people, which cost 28 euros per hour. There was a red tourist bus similar to the famous hop-on hop-off bus, which cost 17 euros for a day tour. 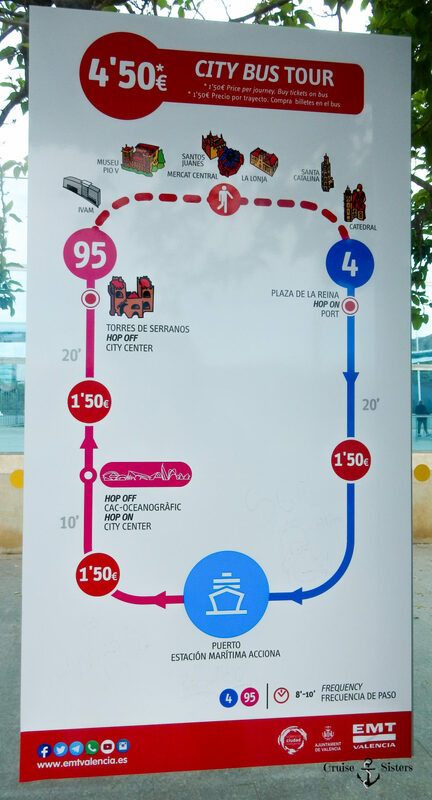 Valencia has also a very convenient public bus system. 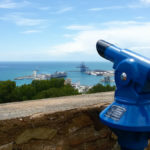 You can take the public bus to the city as well as to the aquarium and the City of Arts and Science (Ciutat de les Artes les Ciències). We walked out of the port building and walked straight towards a wall. Here was already a sign for the public bus. We followed the signs and went left to the main road and the large roundabout. In the right part of the roundabout the public bus stopped. You have to take the bus number 4 to get to the city center. To get to the aquarium and the town of science you have to take the bus number 95. 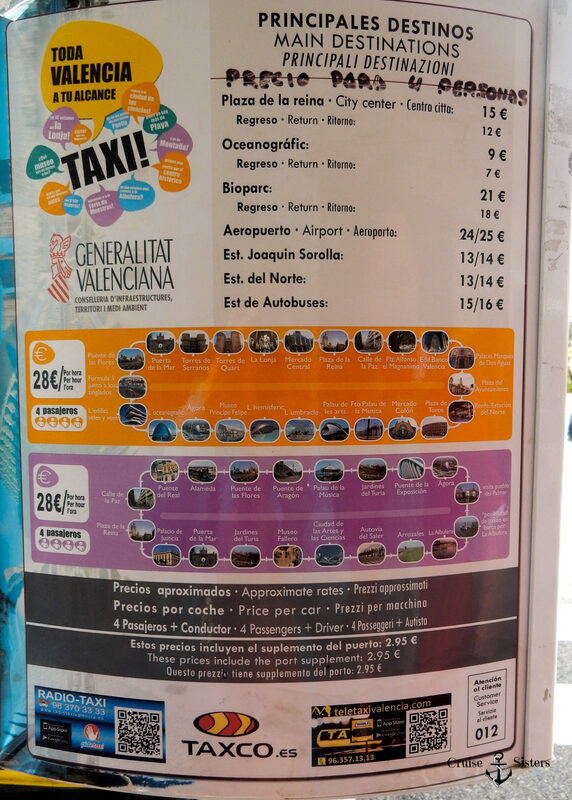 A trip costs 1.50 euros per person and the it took us around 20 minutes. At the bus stop was also described how to combine both buses to a city tour for 4.50 euros. Bus number 95 stops right outside the entrance of the aquarium. 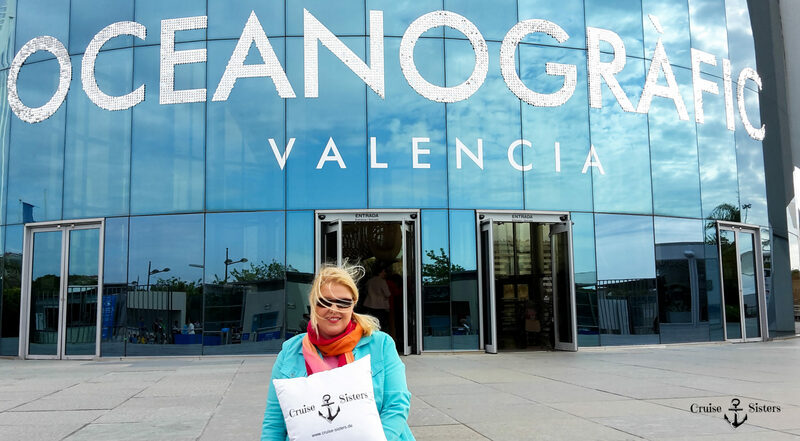 The Aquarium of Valencia is the largest aquarium in Europe and it takes a lot of time to see everything. We spent the whole day there. The aquarium consists of many different buildings. The dolphin show took place twice. We went to the first show. 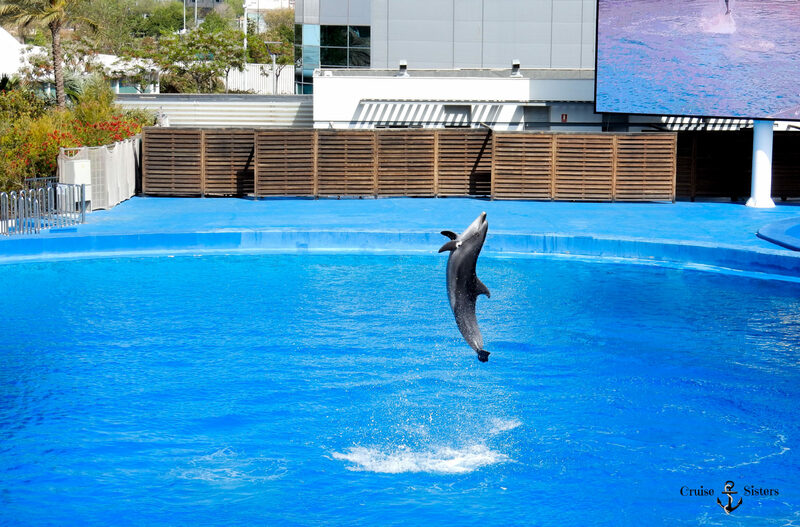 This show was different from the usual dolphin shows, which we knew from other aquariums. It was not simply an entertaining show, but also very informative as they told a lot about the protection of the seas and the dolphins. 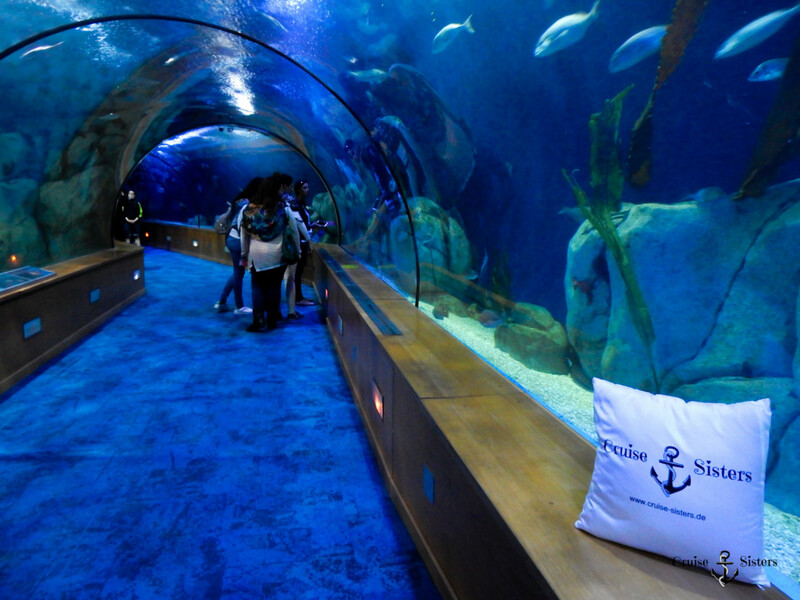 Since you can spend the whole day in the aquarium, it is worth to visit the restaurant and bar. There we tried typical tapas. We chose them at the counter of the bar and then enjoyed them on the terrace in the sun. In the shark building is a huge glass tunnel. Here we saw all kind of sharks and stingrays right next to us and above our heads. 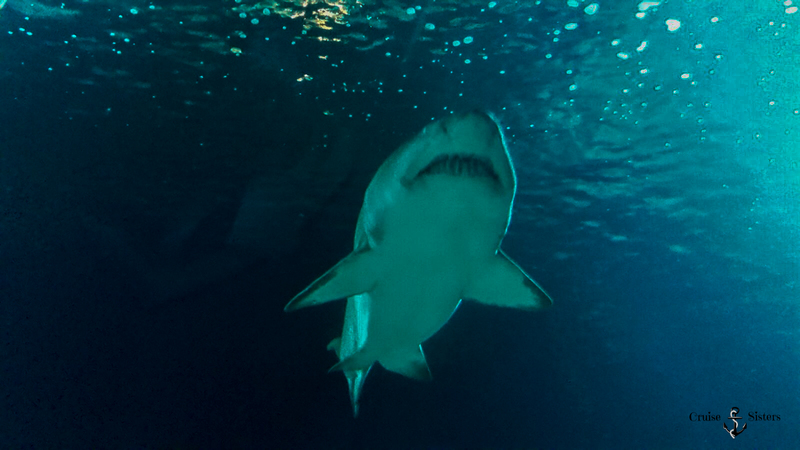 It’s an amazing feeling when you know that you are so close to the sharks. Thankfully, a thick bulletproof glass was inbetween us. The Arctic and Antarctic are right next to each other and are connected with a tunnel. In the Arctic, we watched the beluga whales and in the Antarctica we saw cute penguins. It was a wonderful experience. After a day at the aquarium, we took the bus back to the Eurodam. 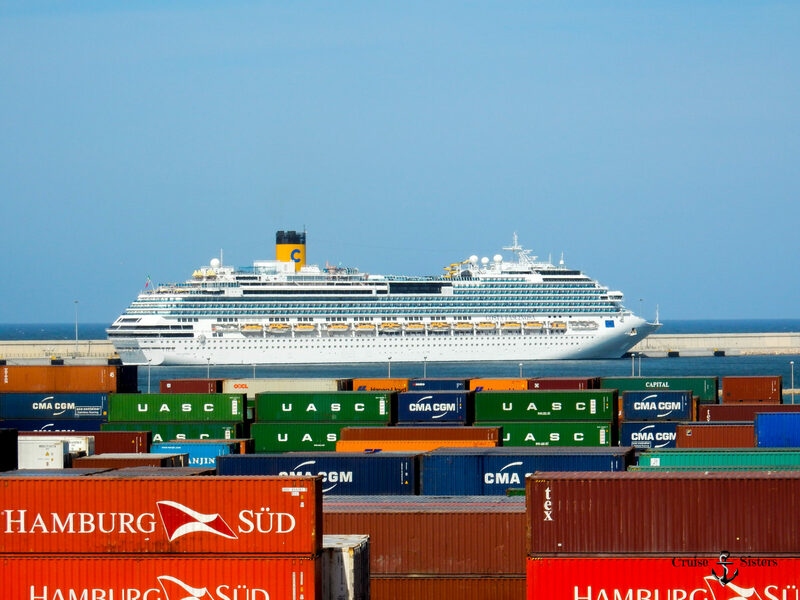 At the exit from the port of Valencia we also saw a Costa ship. Then we got ready for the gala evening. At the gala evening on the Eurodam you should wear formal clothes. It is a great possibility to wear a suit and a dress. Today’s gala evening was a special occasion. 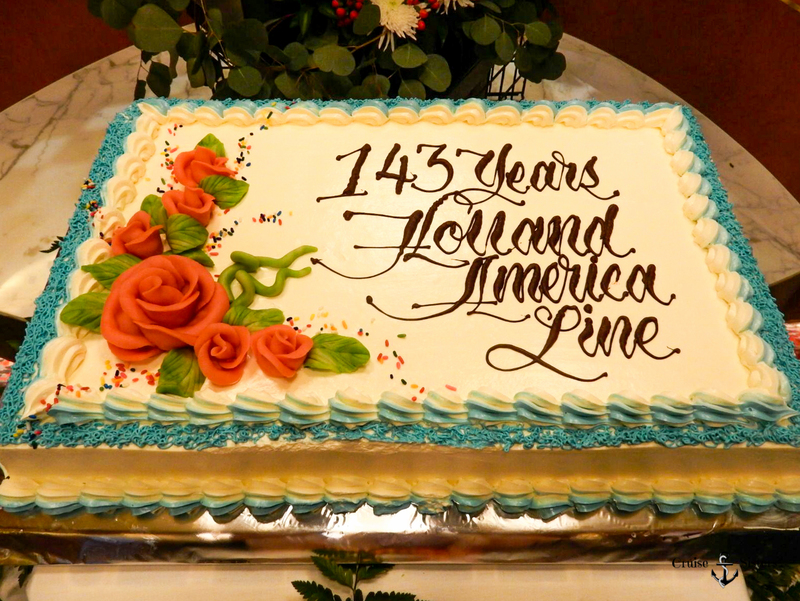 We celebrated the 143rd birthday of Holland America Line. Since 1873, the Holland America Line takes passengers across the oceans. At that time, the ships went mainly from Rotterdam to New York and benefited from the emigration flows. 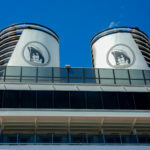 Even today the city Rotterdam is still a traditional cruise destination and Queen Maxima of the Netherlands christened the new cruise ship MS Koningsdam on the 20th of May this year. A large cake with the birthday lettering greeted us at the entrance of the main restaurant. The tables were decorated very nicely with a silver-colored menu card. 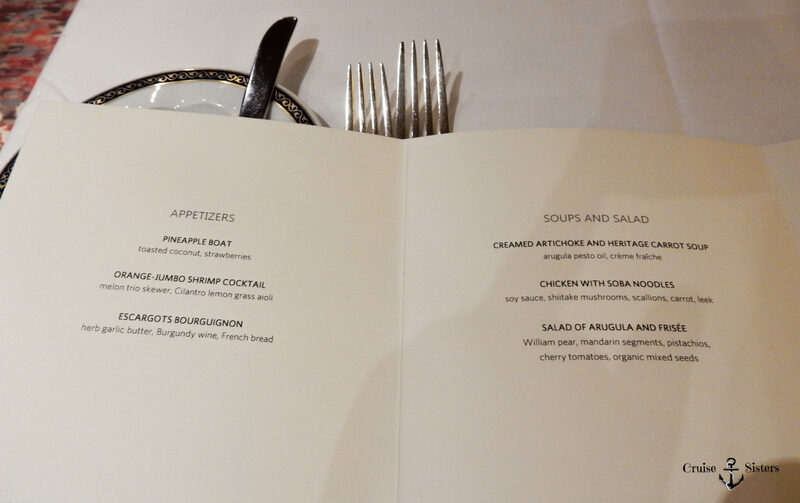 Today there were four courses to choose from. 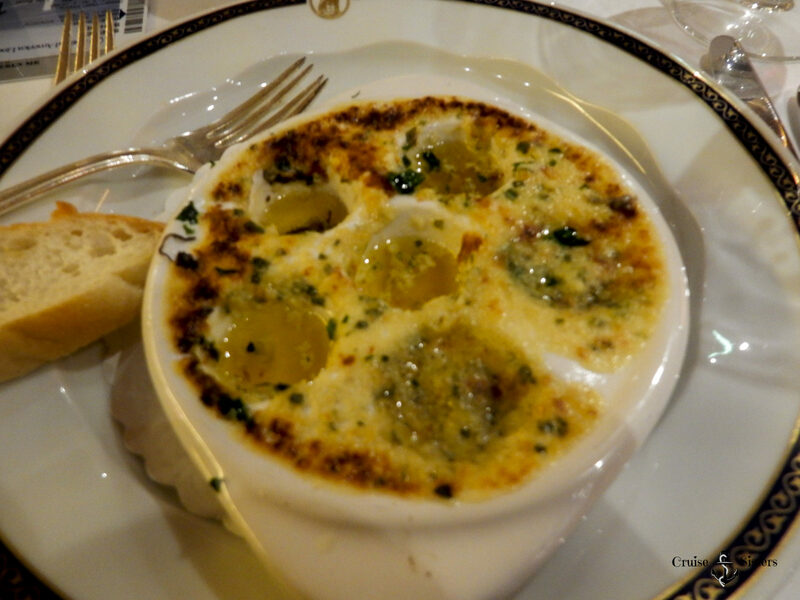 As a starter we could choose for example snails or a shrimp cocktail and as an intermediate gear soup or salad. 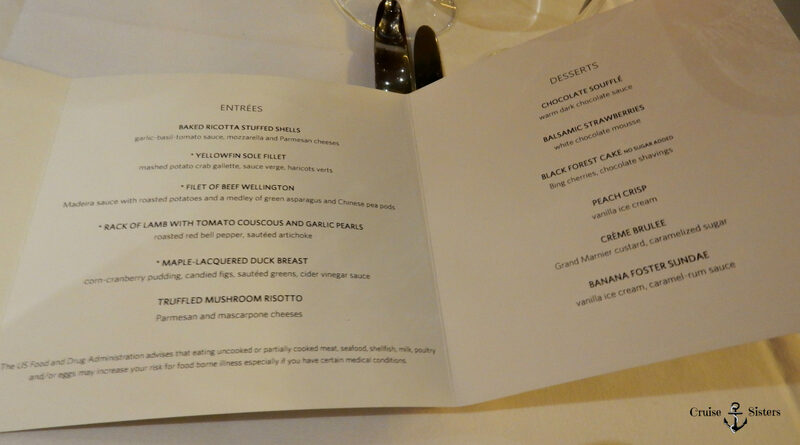 For the main course we had lamb and beef Wellington. 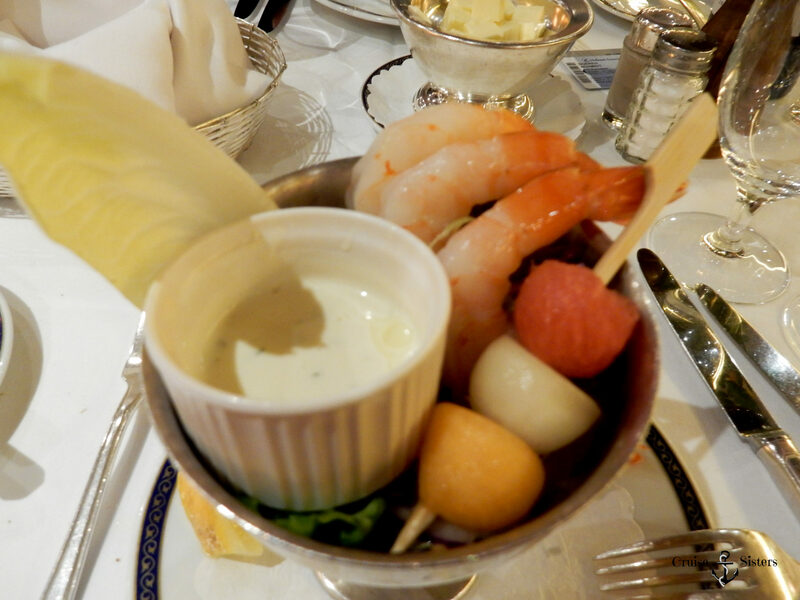 There were also various desserts such as ice cream or a cheese plate. 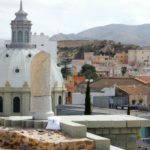 After this great day ashore and the wonderful gala evening we looked forward to our gem number two: Cartagena. Super geschrieben. 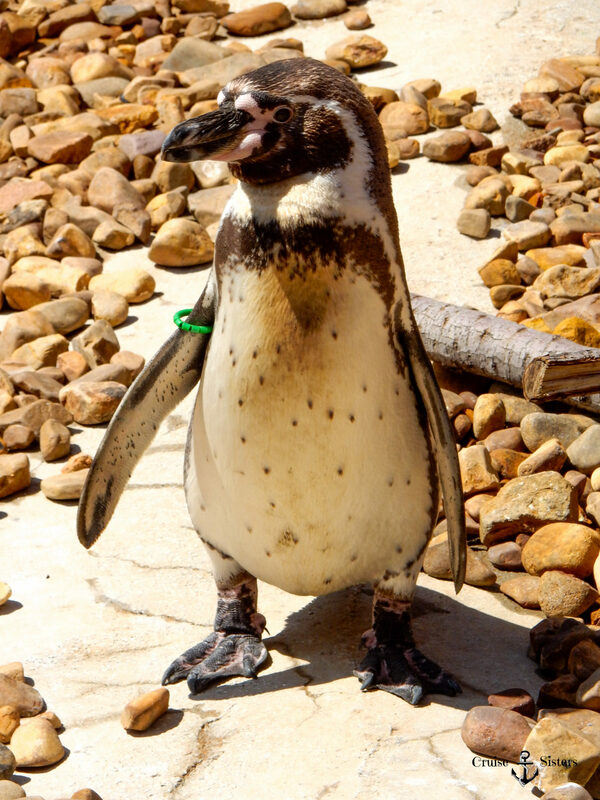 Wir haben das Aquarium auch besucht und waren begeistert. Insbesondere der Glastunnel hat es uns angetan. 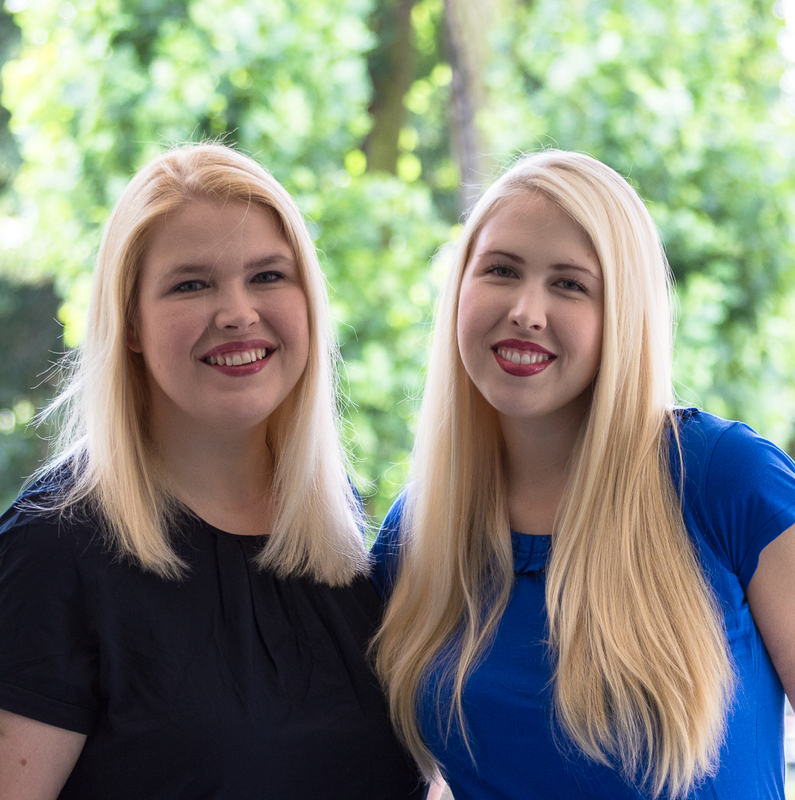 So nah sind wir den Meerestieren noch nie gekommen.